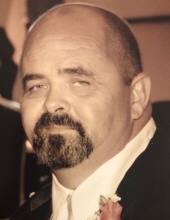 Donald L. Winge, 61, of Bradley, IL, died on Tuesday, November 27, 2018, at his residence. He was born on July 24, 1957, in Kankakee, IL, the son of Lawrence and Irene Prince Winge, Sr. He married Lisa Booi on August 18, 1979, in Kankakee, IL. She survives. He is survived by a son and daughter-in-law; Jeremy and Becky Winge of Chebanse, IL. One daughter and son-in-law; Angie and Justin Valdiviez of Kyle, TX. One granddaughter; Emilie Margaritte Valdiviez. Two sisters and brothers-in-law; Joyce and John Latham of Bourbonnais, IL, and Donna and Al Trefz of Jackson, TN. Two brothers and sister-in-law; Larry and Debbie Winge, Jr. of Kankakee, IL and Bob Winge and Jan Bordenaro of Kankakee, IL. He is preceded in death by his parents, father-in-law; Marvin Booi, brother-in-law; Keith Salm, and close family friend; Sieglinde Boggess. He retired from Armstrong World Industries in Kankakee, IL and also worked previously as a realtor for many years. He was a member of the St. Paul’s Lutheran Church in Kankakee, IL. He was a member of the Kankakee Jaycees where he served as past president and JCI Senator #71999. Donald was a founding member of the Kankakee Air Festival and served on the Bourbonnais Volunteer Fire Department. Donald loved cooking for family and friends, traveling and flying as a private pilot. He always took care of his family first and built three houses for his family, as well as many apartment complexes. He was a great story teller and didn’t know a stranger. His life was centered on God, his family and the people that surrounded him. Donald always loved a new adventure, which also included overseeing many of the area firework shows for many years. To send flowers or a remembrance gift to the family of Donald L. Winge, please visit our Tribute Store. Rev. Karl Koeppen will officiate. In lieu of flowers, please make a memorial contribution. "Email Address" would like to share the life celebration of Donald L. Winge. Click on the "link" to go to share a favorite memory or leave a condolence message for the family.